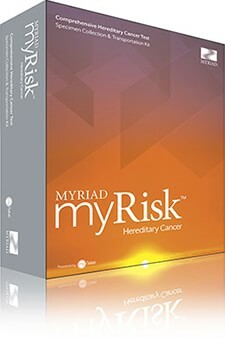 Blending both genetic test status AND personal cancer family history, Myriad myRisk hereditary cancer panel represents the next generation of hereditary cancer risk testing. Myriad myRisk identifies elevated risk for 8 important cancers by analyzing multiple, clinically significant genes. Additionally, Myriad myRisk provides a summary of medical society guidelines to help you optimize your patients’ medical management. Be confident you know your patients’ cancer risks and appropriate follow-up management with Myriad myRisk Hereditary Cancer. Order your test kit today! Every patient in your practice should be evaluated for hereditary cancer risk. The identification and management of family cancer history follows a four-step protocol similar to that used to evaluate Pap tests and clinical breast exams. It can become a seamless addition to your new-patient assessments and your annual wellness examinations. It will increase early detection, and help you tailor your medical management of patients with inherited risk factors and can help reduce patients’ risk of developing cancer. An easy-to-use, interactive e-learning program that will show you and your staff how to implement a a simple and effective hereditary cancer risk assessment (HCRA) protocol into your practice.